After nearly one and a half months, my vine charcoal dual-portrait commission is nearly finished. All told, the piece comprised about twenty-plus hours of solid drawing time interspersed with plenty of standing back and staring at it for a while. As my drawing skills have progressed, I’ve found this to be a very important part of the process. I think working on the Bargue plates has been the greatest boon to my skills, in that it has taught me patience. It taught me to make some marks, then step back, observe, compare, correct, and repeat. Every time I finish a new and more challenging piece, I’m reminded of just how much I’ve learned from my introductory work on the Bargue course. I highly recommend it to anyone interested in seriously pursuing representational fine art. Ok – getting back to the subject at hand, I found this drawing to progress rather well. Starting out is always the hardest part for me because my evil impatient nature has to be tempered as I do the labor-intensive work of blocking in all of the darkest darks with soft charcoal. My instinct is to head straight-away into rendering, but the natural progression must be followed if the drawing is to turn out correctly. My weapon of choice for this piece was the new Grumbacher vine charcoal . I had heard about it and seen it advertised and had high hopes that it wouldn’t let me down. My professional review – the extra-soft sticks were awfully thin and I had to be extra careful not to break them as I worked. Also, there seemed to be a lot of hard spots in multiple sticks that I tried, which is the most frustrating thing one can encounter when trying to work with vine charcoal. They did, however, achieve a darker tone than I was able to get in my drawing of the Indonesian Children with Windsor & Newton’s extra-soft vine charcoal. There didn’t appear to be a lot of difference between the soft and medium density sticks in regard to their working properties, but they had a nice thickness and were fairly consistent. I employed the hard density sticks the most with this piece, and I found them to be truly wonderful to work with. They sharpened nicely and didn’t wear down too quickly. I found that if I worked with a rotation of 4 sharpened sticks, it would give me enough time to work through a particular passage until it was time that I should stop and observe for a while. I was able to work up some really nice subtle tones in Kirsten’s arms and t-shirt with the hard density sticks. I found that a good method to slowly build up tone is to lay down some light strokes with hard charcoal and then brush it with a small bristle fan-brush. Again – patience is the key here… The strokes should be laid down very lightly and then brushed lightly. This process has to be repeated multiple times to build up subtle tones, but it really works – especially on surfaces that should have a smooth texture, like skin or cloth. A note of caution, however: avoid brushing over the darkest areas. 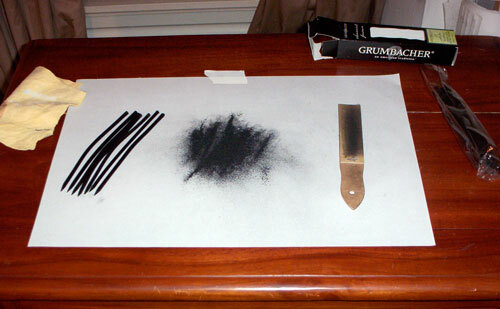 The soft and extra-soft charcoal doesn’t blend into the paper – it just brushes right off… After that, it’s impossible to build the darks back up to where you began unless you spray your drawing with a workable fixative. And then, in my opinion, it just doesn’t look as good. Also, it’s a good idea to use this technique sparingly – that is, only on smooth textures within the drawing. It can look a bit overdone if used throughout the whole piece. This drawing was a “next-step” test for me. 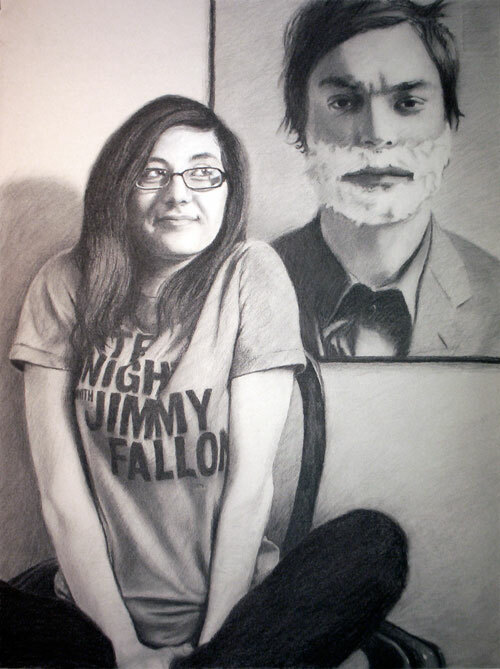 I had never done a dual-portrait, nor had I attempted to draw someone with a lettered t-shirt. In this case, those letters were very important, too, because they help to tell the “story” of the piece, so they had to be well done and readable. 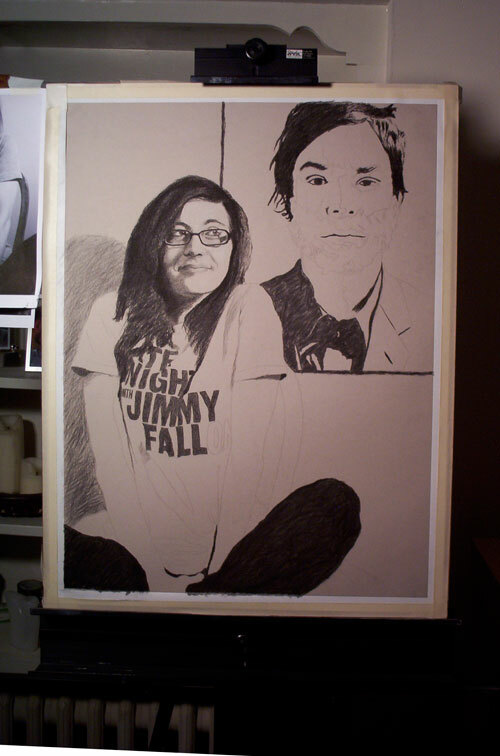 One of my biggest worries going into the project was how to make the picture of Jimmy Fallon appear to be a flat image hanging on the wall behind Kirsten. I knew that I would have to compress the value range in order to achieve this visually. As it turned out, it was a lot easier than I had imagined. I had begun making the darkest marks with extra-soft charcoal, but then decided to brush it off and render his entire portrait in hard charcoal only. This immediately solved the value-range issue and actually helped the drawing to progress much faster.